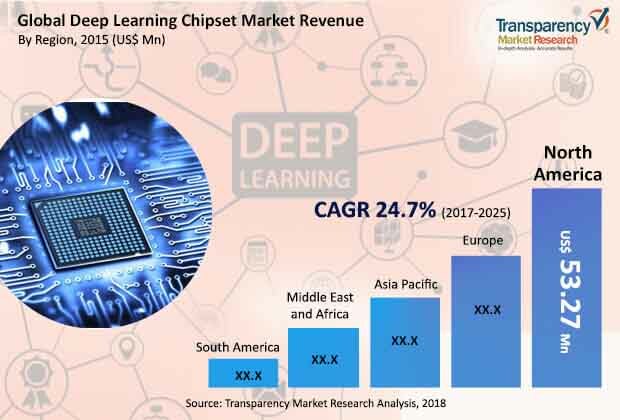 The global deep learning chipset market is primarily driven by significant improvements in the chip algorithms in the last few year, which has enormously increased their ability to consume and manage data efficiently. With increasing adoption of the Internet of Things (IoT) that promises to connect billions of new devices and pertaining data streams, it is very likely that much more digital data will be generated and consequently, the industry of machine learning and deep learning will flourish. Moreover, newly build algorithms are shifting the learning from one particular application to another application, making it easily possible for the machines to learn from very fewer examples. Invention of a related computer chip, which is known as GPU or graphic processing unit, is turning out to be very meaningful and effective when it is being applied to types of calculations required for neural nets. Speed up of 10x times are also very much viable when the neural nets will move from traditional CPU to GPU.